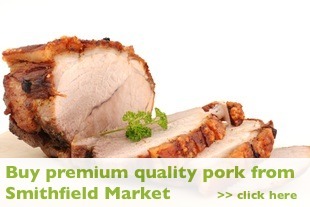 Buy a good quality roast pork cut/joint from a quality butchers. Take your joint out of the fridge and allow it to warm up for at least 30 minutes before cooking. Pre- heat the oven and make sure it has reached the desired temperature before you start cooking. For good crackling: make sure the skin is very dry before you cook it. Dab it with clean paper kitchen towels until it is dry. Then score the skin before roasting – this allows the fat from underneath to bubble up, crisping the skin as it does so. Use a very sharp kitchen knife (taking care not to go through to the flesh), cut 1cm apart in diamond shapes. Sprinkle the skin liberally with sea salt just before you put it into the hot oven. (Any earlier and the salt will attract moisture). Remember the best crackling comes from large joints that have spent at least two hours in the oven. Plan your roast pork cooking times by using our roasting times for pork table provided. Write them down, time them, don’t forget the meat is in the oven. The roasting pork cooking times given on our roasting times for pork table should be accurate to ensure the pork is cooked until it is no longer pink. However, the only way to really know if the pork is cooked is to test it. To test the temperature (it should be 70C) you can use a temperature probe. If you haven’t got one of those, insert a flat knife or skewer into the thickest part of the meat, then take it out and press the surface hard with the side of the knife or skewer and watch what colour the juices are that run out. There should be no traces of pink left in the juices. Clear juices indicate that the pork is cooked, but that the meat will still be beautifully moist. Take the pork out of the oven, baste again then wrap in foil to keep the meat warm. Place in a warm spot and allow the meat to rest or relax for 20 to 30 minutes. The meat will keep cooking during this time. There you have it how to cook roast pork with crackling easy. The initial oven temperature was too low. There are a few things to do for next time. Make sure you heat the oven first, check its temperature before cooking, and plan your roast pork cooking times more carefully. Try next time plan and time more accurately your roasting times for pork Also, invest in an oven and meat thermometer. Check your oven temperature, and ensure you buy meat from a quality butchers like Meat No Veg and take their advice on what is a good beef roasting joint. The bone left in the meat acts as an excellent conductor of heat – This means the meat will not lose juices as fast and it will be cooked faster and more evenly. So watch your ‘on the bone’ joint more closely.